Today I'm happy to share another of my VBS resources for 2018; this time it is, Game On from LifeWay! Take a look and consider if Game On! is a good "fit" for your Children's Ministry! Message/Theme – Children will learn Jesus has given us everything we need to live a life which honors God and the Bible teaches us how God wants us to live. LOVE the "Personal Training" for each lesson in the teacher's info - they are correct; VBS is not just for the children - it is for the volunteers as well, because God's Word is for everyone! I LOVE the "Instant Replay" for each pre-teen Bible lesson which engages children in thinking about, reading and reviewing the Bible event for the day. I LOVE the "Huddle Up" time each day for pre-teen small groups of children (and how they are encouraged to include visitors with church kids) to think about, talk about and focus on the application. I LOVE the "Last Play" section in each day's pre-teen lesson where children are encouraged to pick a way they will live what they learned. I'm very happy to see the Bible opened, taught from and used with the children in each age group. As I would expect, Game On! has a strong evangelistic emphasis, excellent local mission project and solid Bible teaching. Excellent focus on VBS and prayer - info on how to develop your prayer strategies and prayer team. I found the craft book has a nice variety of craft options made with items you gather - some of these are excellent! I personally liked the way the pre-teen lessons engaged the children in discovering what God's Word says, talking it over, focus on understanding it and encouragement for them to live it. I would use this age level for all the ages - just tweek a bit for younger children. 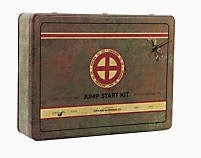 The Opening and Close included in the starter kits. It is in the Worship Rally resource, which is purchased on its own - $42.99 for the Worship Rally Pack. The Director's book in the starter kit - it is in the Jump Start kit - which is purchased on its own. I'd like to see a complete kit - preschool, elementary, director's information and opening/close all in one kit. With them spread out the price really adds up. Having main and necessary components spread out between different kits/resources is frustrating and confusing - it does not need to be. LifeWay says, "LifeWay’s 2018 VBS invites your children to grab their megaphones, lace up their cleats, and tune up their instruments. As they fill up the offensive line, sideline, and drumline, your players, cheerleaders, and band members will realize God has given them His ultimate playbook. He wants them to join His team, train hard, celebrate salvation, and encourage one another. Get in the spirit today with Game On! VBS." While I am not personally a big fan of game setting VBS resources, I found Game On! to be extremely well written to engage children with a focus on evangelism with solid Bible teaching. This VBS is an truly excellent resource - great for back-yard Bible clubs, Teen mission outreach opportunities, spread out over the year for special family events or mid-week and would be a lot of fun on Sundays in the Summer as well! Take a good look at Game On! to see how it might be a good "fit" for your ministry - it is well worth the time to do so!